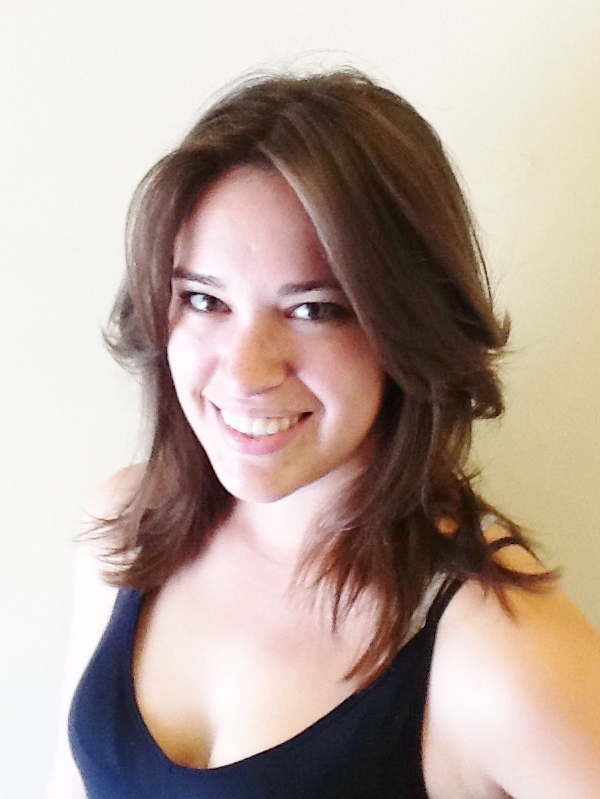 ← Welcome to left coast contessa! A concoction so delicious that it can only be described as “the food of the gods”. Seriously though. It is unclear where the funeral potato originated from or where it got its name. Some say the name comes from the fact that they inevitably always pop up at Lutheran funeral luncheons, which normally take place in the gym next to the sanctuary. Others will tell you that they earned their name because they are “so bad for you, eating them will give you a heart attack”. I like to think it’s a little bit of both. 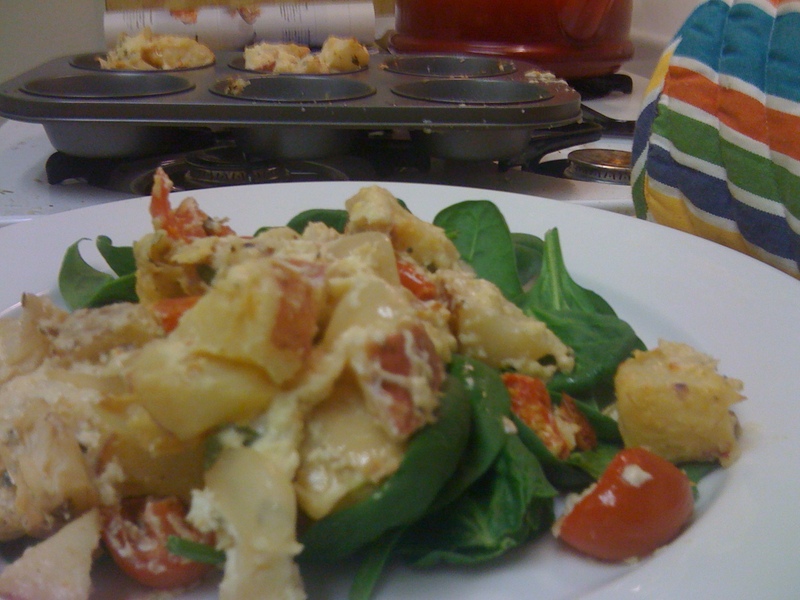 I first became aware of the funeral potato at Easter dinner. My Grammy (my mother’s mom) was hosting. Of course, being good Midwesterners we were having “Grammy’s famous ham” (which was really just a run of the mill honey baked ham), rolls, asparagus, and funeral potatoes. The funeral potatoes entered the dining room in a casserole dish and I smelled of one thing: cheese. It was love at first smell. Lets admit it, besides being bad for you, cheese can really do no wrong. It might be the perfect food. And my “might be” I mean that it is. From the first bite I was hooked. The flavor is that of cheese melting with the creaminess of sour cream and the subtle hint of green onions. All seasoned with a gratuitous amount of salt. Love, sweet love. An entire dish serves 6 people. I almost never had this many people to serve. They are really bad for you. All fattening things. 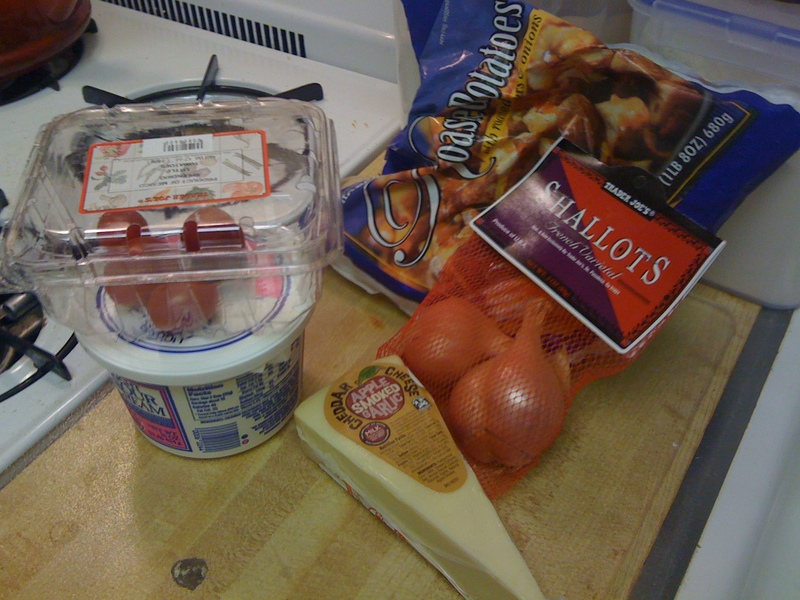 Cheese and sour cream are two of the three main ingredients. Sheer laziness. They are a side dish and I never had the energy to make a whole meal to go with them. Not that I would be opposed to making an entire casserole dish and eating directly from the dish at, say, 7 pm for about 30 mins. I have done it before. Eating them that way never exactly does right by them though. Mostly it makes me feel both fat and shamed. So with the conviction to make a grown up funeral potato that was deserving of a main course I headed to Trader Joe’s in Westwood and came up with a new recipe. The basics cannot be changed. To have good funeral potatoes there must be potatoes, cheese, and sour cream. Up front I will tell you that the only LA thing about this is the non fat sour cream. I know. Healthy fail. I vow to start fresh tomorrow. In the tradition of my Grammy I only use frozen potatoes. Those who know me understand that I am a fan of fresh ingredients and always try to cook from scratch. This is the exception. Grammy used this and so I do too. Also, its a time saver and it saves you from chopping potatoes. 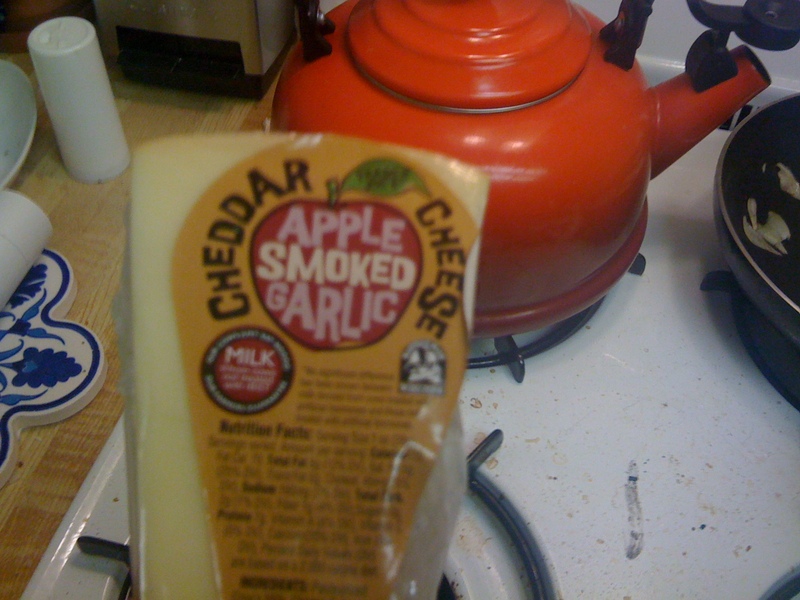 I went to the cheese section and picked up a smoked apple wood cheddar with garlic. The cheese should stand out. I didn’t want to stray too far from convention but its not a Kraft bag so I figured it was inventive enough. I could imagine things like goat cheese or Brie or something really off beat in the future. 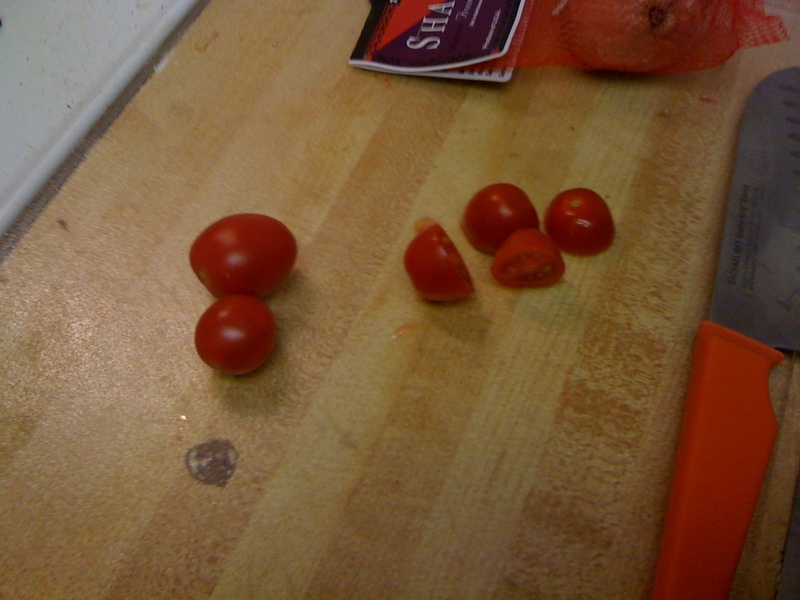 Next I grabbed a shallot, and cherry tomatoes. Once home preheated the oven to 350 and cooked one sliced shallot in a pan with a dollop of EVO over medium heat until softened (3 mins) and seasoned with salt and pepper- one pinch each. I love the red color of the tomatoes! 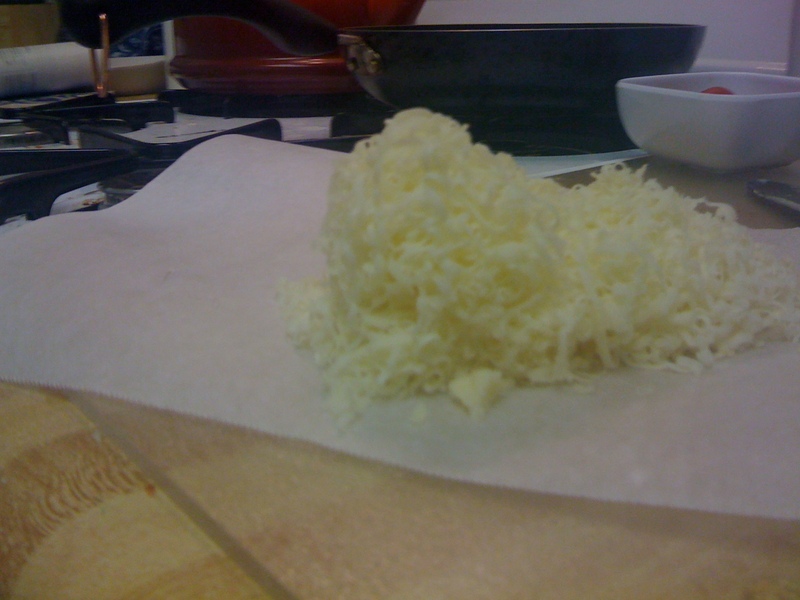 I grated the cheese and set it aside. I used about 3/4 of the wedge. 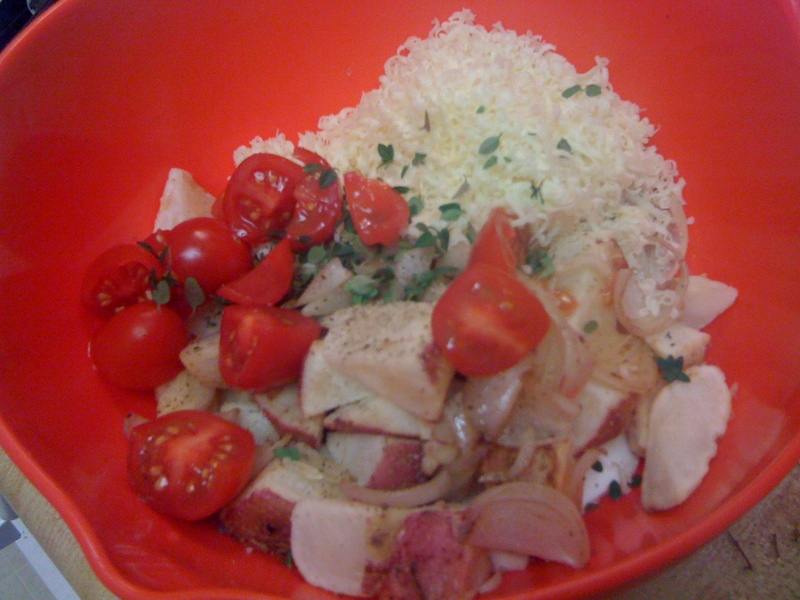 In a bowl I added a large spoonful of sour cream, a serving of frozen potato, the cooked shallot, salt, pepper, fresh thyme (from my garden- told you I like to cook from scratch), and a handful of sliced cherry tomatoes. Mix the ingredients. 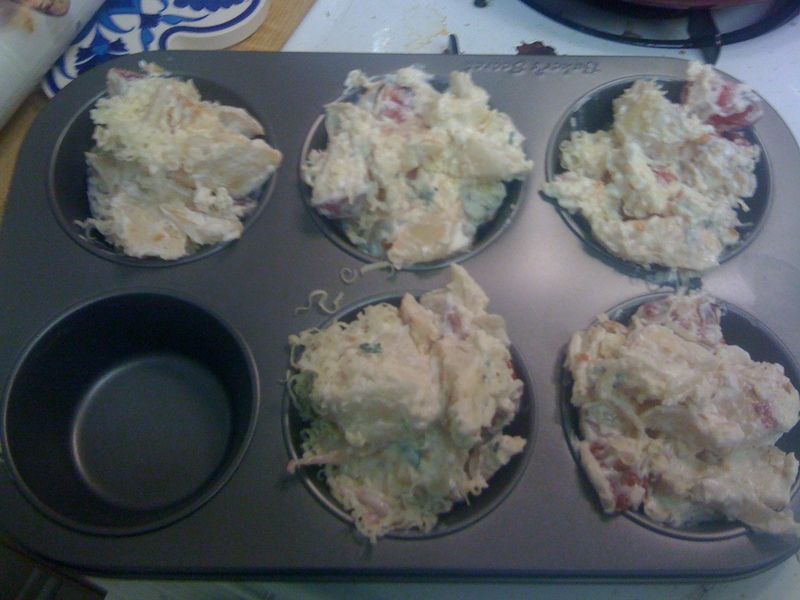 I put the mixture in a large size no stick muffin tin (in a sad effort to have portion control). And put it in the oven for 35 mins, checking periodically. Mixed and awaiting the oven. We can call this "before". In the meantime I made a bed of spinach for the potatoes to rest on and waited for the deliciousness to emerge from the oven. 35 mins later my apartment was enveloped in the rich aroma of cheese, glorious cheese. I removed the potatoes from the oven (they should be slightly browned on top) and let them cool for 5 mins before placing them on the spinach. All I can say, so so so good. The cheese really is the ingredient that should pop. 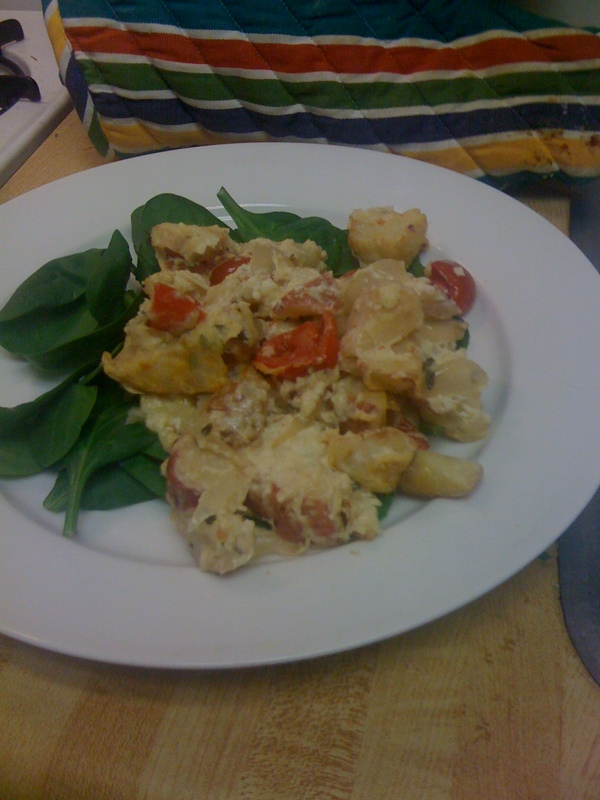 The rich smoked cheese made the potato that much more savory. 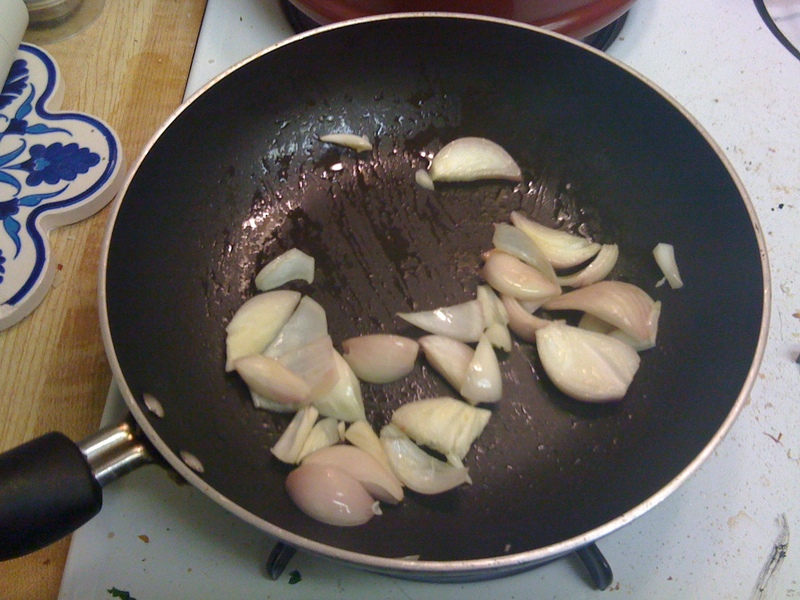 The shallot gave a slightly crunchy and a more subtle onion flavor than regular onions would. 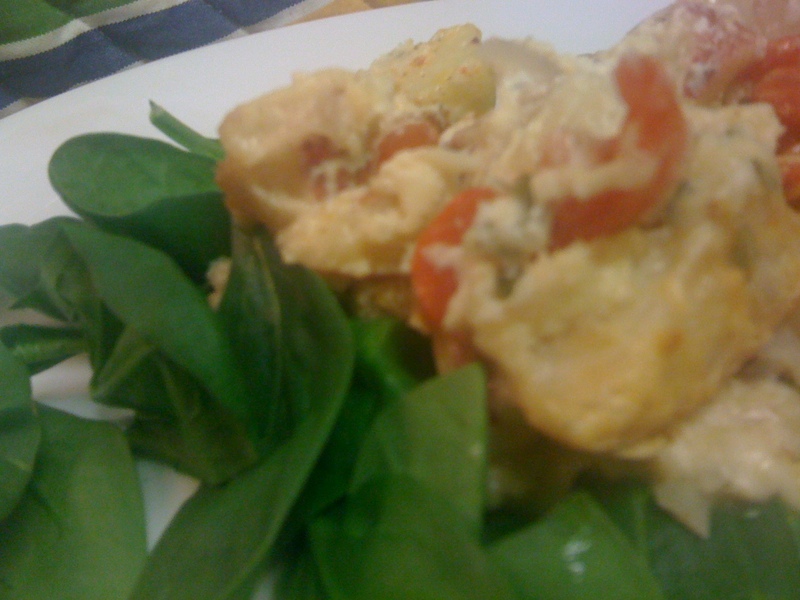 Mixed with the thyme seasoning, the recipe so good I eagerly helped myself to seconds, sans spinach, with no shame. YUM. It’s okay I have been comfort fooding myself silly! Our lives are hard. And you can be the first to look at my blog since we have overlapping entries 🙂 I tried to recap the foodie highlights of LA!